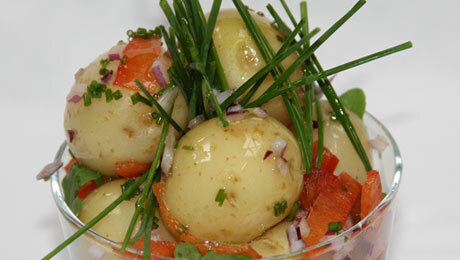 Wash the new potatoes and cook in boiling water for about 10 minutes or until tender. Meanwhile heat 2 tablespoons of the oil and fry the strips of pepper in it. When the potatoes are cooked, drain them and put them with the onions in a bowl. Add another tablespoon of oil to the peppers in the pan and pour them over the potatoes. Toss, season with salt and pepper and garnish with the chopped herbs.